Tiger Gamin Poker is a fairly small poker room suitable for hobby players looking for soft games. It is a part of the Chic Poker Network, and owned and operated by Thot Management NV. The gambling licenses comes from Curaçao. Tiger Gaming Poker focuses chiefly on low-stakes players. The minimum for cash games is $0.01/$0.02 and the maximum is $5/$10. When it comes to multi-table tournaments, it is exceedingly rare to find a tournament here where the buy-in is larger than $50. For Sit & Go’s the situation is different and you can find tables where the buy-in is $500. Unlike poker rooms like PokerStars and Full Tilt Poker, Tiger Gaming Poker do not block players from the United States. 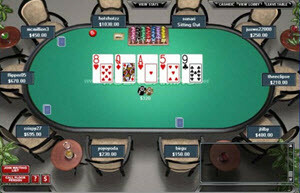 The poker software used by Tiger Gaming comes from the Chico Poker Network and far from perfect. One simply has to bite the bullet and accept that this software isn’t very good looking or super smooth to use if one wants to gain access to the super-soft poker games offered by Tiger Gaming. Sometimes the software has a rather annoying delay. No mobile poker apps are available. Finding Chinese Poker and Big Two Poker online is really rare, so this really sets Tiger Poker apart from other poker rooms. In Chinese Poker, the player receives 13 cards dealt from a standard 52 card deck. Each player must divide these 13 cards into three poker hands; two containing 5 cards and one containing 3 cards. In Big Two, the number of cards you receive will depend on the number of players at the table. With four players at the table, each player gets 13 cards. Big Two is a shedding-type game known by several different names, including dà lǎo èr and co daai di. Compared to giants such as PokerStars and 888 Poker, Tiger Game poker has a very limited tournament offering, but it does include some variation, e.g. turbos, freerolls, 6-max and satellite tournaments to bigger events. Multi-table tournaments rarely have a buy-in that exceeds $50 and considerably smaller buy-ins is the norm here. With Sit & Go’s on the other hand, there are tables available up to a whopping $500. Sit & Go’s are very popular at Tiger Game Poker, on all levels. The largest MTT:s with guaranteed price pots have a $20,000 guarantee, so Tiger Gaming Poker is not the place to go if you are looking for poker tournaments with huge guaranteed price pots. Heads-up tournaments are available at Tiger Game Poker. Tiger Gaming Poker is a part of the Chico Poker Network, one of few poker network that still accepts players form the USA. The most famous poker room in this poker network is arguably the BetOnline poker room. The Chico Poker Network doesn’t have a lot of traffic, and a lot of non-US players stay away from this site since it is always a bit risky to deposit money with a gambling site that accepts players form the USA. If you dare to make a deposit despite this, you will be rewarded with access to some amazingly soft poker games. Chico Poker Network is famous for having really soft play. You will find a lot of players at the poker tables that are willing to take huge risks, or that simply fail to understand that they are playing very risky hands. You get a 100% bonus on your first deposit, up to a maximum of $1,000. Some affiliates have negotiated better deals for the people they refer, e.g. 100% bonus up to $2,500. To release your bonus money, you need to play real-money games. You release $1 for each 14 Player Option Points (POP’s) you gather. When you have made your first deposit to Tiger Gaming Poker you gain access to a first-depositors tournament. Play poker for real money and gather Player Option Points (POP’s). POP’s can be exchanged for various perks. This is the total extent of the loyalty program, there are no levels to climb or similar. The Tiger Gaming Poker leaderboard competitions tend to be rather generous. English speaking support staff is available 24/7. There is no telephone support, but you can use the live chat to get real-time support. Email support is also available, the address is support@tigergaming.com. Tiger Gaming Poker is owned and operated by Thot Management NV and licensed in Curaçao. Chico Poker Network has its roots in Action Poker, founded back in 1999. Eventually, Action Poker became Playsafe Holdings AS (2006). In 2011, Playsafe Holdings AS was purchased by Julian International Holdings Ltd and the network was renamed Chico Poker.